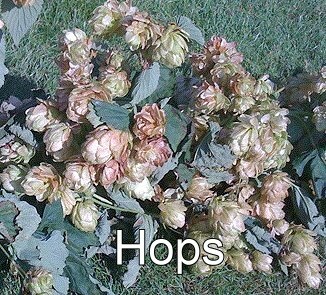 Hops are flowers that are added to beer during brewing. They give beer its bitter taste and smell. Hops were introduced into England in the first quarter of the 16th century by Flemish immigrants. The first English book written about hop growing by Reynolds Scot, was published in 1574. It recommends that poles be errected in the spring as soon as the hops are above the ground. At Hallaton in Leicestershire, the Hare Pie Scramble and Bottle Kicking, an unruly rugby game between the village of Hallaton and Medbourne, takes place every Easter Monday. On Easter Monday, The World Coal Carrying Championship takes place in the village of Gawthorpe, in Yorkshire. Contestants run for one mile, carrying a 50kg bag of coal. The contest dates from an incident at the Beehive Inn in 1963, when Lewis Hartley said to Reggie Sedgewick: "Ba gum, lad, tha' looks buggered!" to which an affronted Mr Sedgewick riposted: "Let's 'ave a coil race from Barracks t' Maypole." And they did.